Don’t underestimate the impact of new Iran sanctions. This is a big deal. On May 8, 2018, President Trump formally ended the Joint Comprehensive Plan of Action (JCPOA). 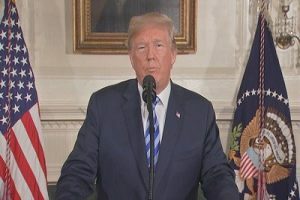 That’s the official name for the deal concluded by the U.S., Germany, the UK, France, China, Russia and Iran to suspend the Iranian nuclear enrichment and nuclear weapons program in exchange for cash, gold and the end of U.S. economic sanctions. This article takes that assessment a step further by showing the many ripple effects that stem from this decision made by Trump. Iran will be completely cut off from the global financial system. It will be unable to pay or receive hard currency for its imports and exports. Foreign investment will dry up, telecommunications and transportation links will wither, and Iran can forget about buying advanced western technology from Boeing, Airbus, IBM or SAP. The hope is that the economic pressure will force Iran to come back to the bargaining table and work out a deal more satisfactory to Trump. That worked before with Iran in 2013 when a prior round of sanctions got Iran to begin negotiations. The problem was that the deal negotiated then, which became the 2015 JCPOA, was badly flawed. Economic sanctions worked again recently with North Korea when they came to the bargaining table to meet with Trump to discuss denuclearization of the Korean peninsula. But, the new Iran sanctions could drive Iran closer to Russia and China, and point in the direction of a new payment system that does not rely on the dollar. It could also lead to a military coup, civilian unrest or a new war in the Middle East. No one knows exactly how things will play out, but we do know U.S. stock markets dislike uncertainty. Get ready for resumed volatility in U.S. markets as traders and investors try to navigate the shifting winds coming from the Middle East.